As you can probably guess, I am a fan of the Morning Glory. 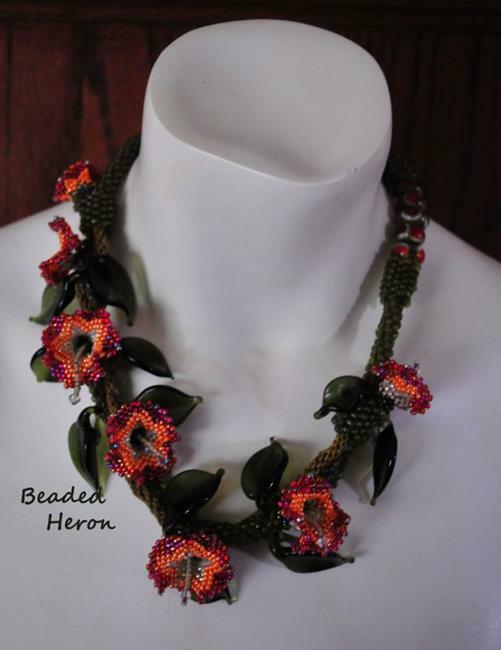 I have been making the beaded version of one of my favorite flowers for going on a decade, and since the day I made that first flower I had a vision in my mind's eye to make a necklace with several of them. The picture I had in my head in the beginning is a definitely a far cry from this piece that actually transpired, though, because in those early days of my beading career I hadn't yet entertained the idea of playing with fire and hot molten glass. In the last few years since I started lampworking, The morning glory necklace vision would continue to haunt me. "You haven't made a morning glory necklace yet" a little voice would remind me on those occasions when I wondered what I might make next. I would think about it for a second or three but the task seemed daunting, even though the end result was something I thought would be worth the effort. Would I even be able to pull it off at all if I tried? Making the components would be no huge deal I thought, but putting them together and achieving the end result was the challenge. I was inspired to tackle this piece and bring my vision to fruition for this month's Prairie Plant exhibit, and this is the end result. 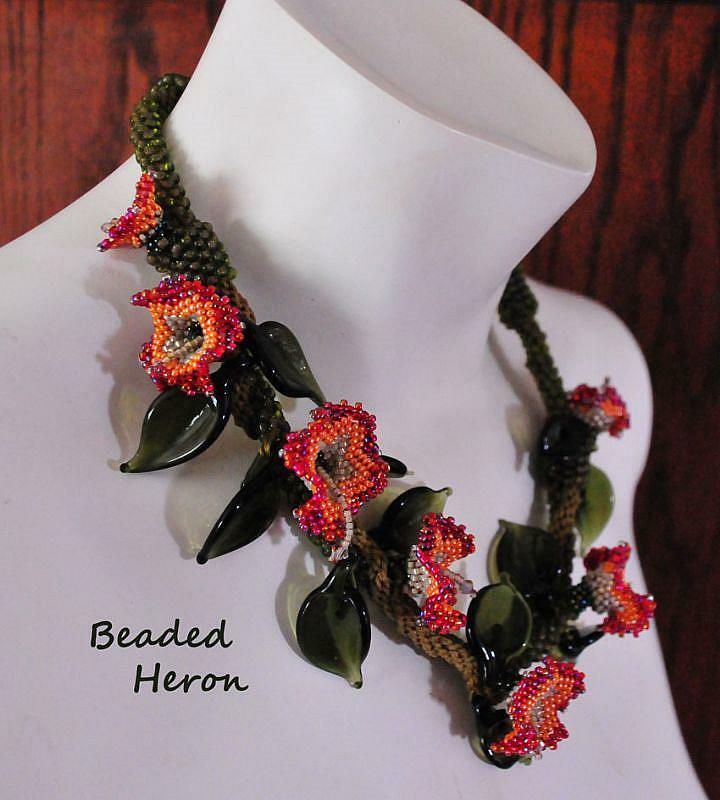 I made the foundation necklace first, which is a beaded Kumihimo braid. Kumihimo is an ancient Japanese form of braiding. Kumihimo cords were used by the Samurai to hold together their armor and their horses armor. 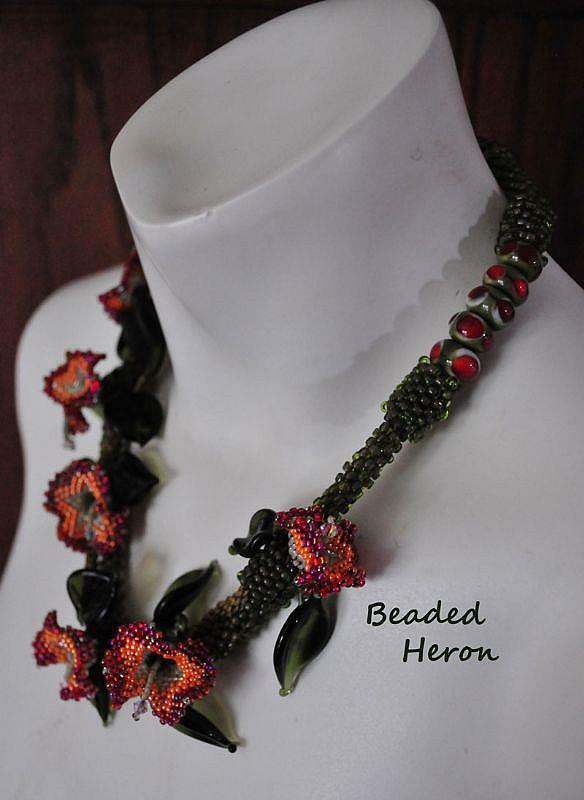 Eight C-lon cords with size 8 seed beads were intricately woven together to form the beaded braid foundation and it is very strong. 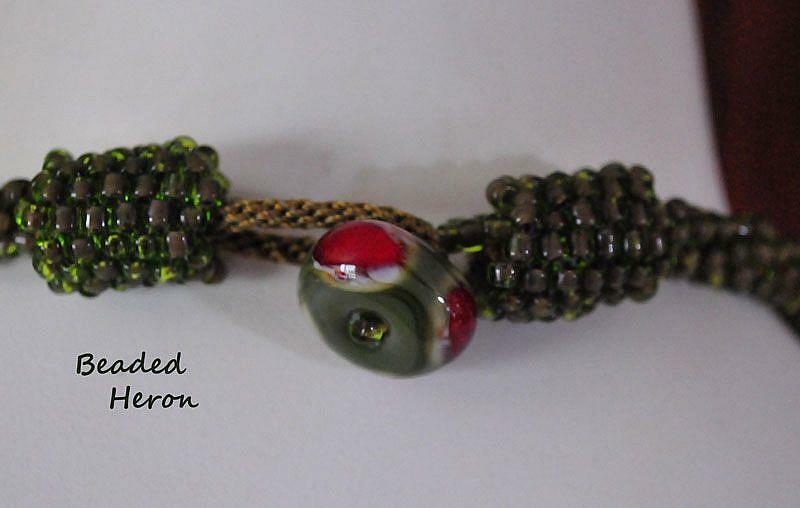 I then made a separate Kumihimo cord which would serve as the vine, and wrap around the base beaded braid. Along the way I spent a couple of sessions at the torch on hot muggy July mornings so I could make the beautiful shapely leaves. The construction took many hours of trial and error while working to make sure the flowers and vine were placed well, and also that the flowers and leaves would lay properly. Since the vine is Asymmetrical, the additional challenge to have it hang properly when worn so as not to twist or move was solved by making a few matching decorated glass spacer beads to act as a counterweight. I also made the bead that was used for the closure. This necklace is 100% made by me with the only manufactured components being the tiny seed beads and the cord & thread that holds it all together.